Aug 21, 2016-Nepal Stock Exchange (Nepse) last week inched up 1.01 points. The benchmark index shed points in the first two days, before making some recovery in the last two days. He said shares of commercial banks have become a safe haven for investors because of the financial strength and good performance of banks last fiscal year. Of the nine trading groups, indices of five posted gains. The hotels group (up 62.96 points) was the biggest gainer, followed by insurance, finance and development banks. Of the three losers, hydropower and banking witnessed a downfall of 22.61 and 3.60 points, respectively. The trading group was stable at 202.79 points. plan to make it mandatory for individuals to insure their homes, widening the insurers business scope. The sensitive index that measures the performance of ‘A’ class companies hovered around 374 points. The transaction volume, however, dipped to Rs4.39 billion fromRs6.5 billion because of less trading days. The number of transactions also fell from 31,402 to 25,731. 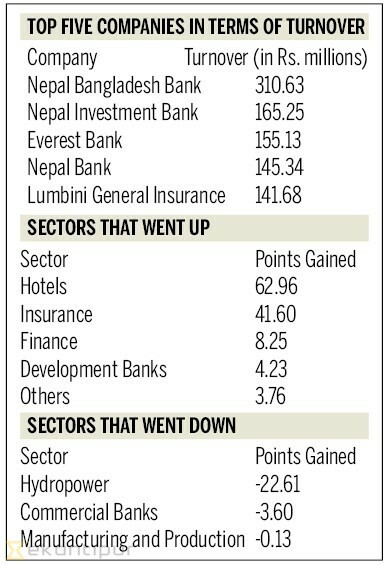 Commercial banks led the charts in terms of turnover, with Nepal Bangladesh Bank posting the highest turnover of Rs310.63 million, followed by Nepal Investment Bank, Everest Bank and Nepal Bank.